With an afternoon spare I decided to forget the regular carping I've been giving most of my time too, and do something a little bit different. I was heading for a stretch of river on the upper Lea. In fact it turned out to be the perfect antidote to all the bivvy, barrow, multiple rods, alarms, and general mass of gear that all seems to be a part of targeting carp these days. This time it was just one rod, a small tackle bag, chair, and landing net. Bait again was minimal, a pint and a half of maggots, a tub of lobworms, and a small bag of pellets. So by the time I arrived at the river it was midday, the sun was out and it was pleasantly warm, and to make it even better no one else was here. I sort out the gear and make my way down the small path to the river's edge. Quietly putting my gear down, I slowly edged my way to the top swim on this venue, which is no more than a dozen yards from the end of the path. A little further upstream lies a fallen tree with it's top branches pointing down towards me, as I peer down into the water I can see some fish lazily swimming out of the branches and down into the open water, then turning and slowly making their way back to the sanctuary of the twisted woodwork. The dark tails give away the chub, and every now and again there's a flash of pink on some fins to let me know that there's one or two barbel down there amongst them. I move away and grab the maggots and pellets, plus a small catapult from my bag. Returning to the swim I fire out a dozen maggots into the dappled sunlit water and watch them drop into the branches before the gentle current pulls them down into the open water below. First to my net and it's a beauty... a 2lb'er, if that! Initially the fish scatter, but soon return and start to seek out the free offerings, next I try a few pellets and get the same result. I then sit there for 20-30 minutes just feeding in small amounts of bait every few minutes until they're almost waiting for the next pouchful to drop. I even notice the outline of a bream come and join the other hungry feeders. Sneaking away it's time to set up the rod, and I'm using my old Harrison Interceptor, which has a 1.10lbTC with a lovely through action, and I've teamed this with a nice centrepin reel… so we're going slightly old school here! The rest of the set up is simplicity itself, with a 3/4oz lead threaded on the line first, then a rubber bead, and finally a couple of Target Line Stops, which can be moved up or down the line to adjust the lenght of the tail, and I start with one of about 8", to the end of which I tie a size 16 Target Specimen hook. I know what's going to happen but first I try 3 maggots on the hook, swinging them out to land just short of the branches. Putting the rod in the rest I then fire out another dozen maggots over the top. Even before I've put the catapult down the rod tip is twitching and after a few seconds I reel in to find a greedy minnow has swallowed the lot... how long has it been since I caught a minnow? Oi whiskers smile... err, you talking to the fish or me? A few more maggots go out, and a few pellets, as they do regularly all afternoon. So I return to my original thought and that was to use a worm on the hook, well half a worm anyway, as these lobworms are big and I dont want some of the smaller fish sucking on the end and giving me false bites. The next bite is completely different with a couple of tugs before the rod pulls round quickly, I grab it and immediately know I'm in to something bigger. A little side strain and I keep my quarry away from the fallen tree's branches which it obviously wants to get back to. Keeping my thumb tight on the drum of the centrepin I only give line when the fish makes a big lunge, I haven't got a lot of room to manoeuvre here so this is when the through action rod comes into play taking the energy out of the fishes runs. I finally steer it to the net, and it's not big, but a perfect little barbel of about a pound and a half. Over the following hour I take plenty of small chub, in the half to three quarter pound stamp, before another proper pull signals that barbel number two has taken the worm. It's about the same size as the first and great sport on simple tackle. With time now slipping away before I have to leave I pop a fresh worm on the hook and cast out to the same spot, and as I step back to place the rod in the rest it lurches in my hand and I realise something has taken the bait on the drop. Clamping down on my reel I lean into the rod as it takes on a circular curve and I watch my line cutting through the water and into the branches. The thumps on the line stop and everything goes solid, the fish has done me! After trying some heavy side strain I know it's pointless, so there's only one thing I can do, slacken right off and put the rod back on the rest and wait. After a couple of minutes the rod tip twitches, the line tightens and the tip pulls round again. I've been sitting inches from my rod and as soon as I see that movement I pull the rod right round and bully the fish out of the snag. It then darts downstream for the cover of some reeds but I'm on it now and keep it in the open water where eventually I get it into the net. Phew! I'm not weighing any of these fish, as even this barbel probably wouldn't even make four pounds, but it still gave a great account of itself. So what a cracking bit of sport, nothing complicated, simple set up, simple bait, and a totally enjoyable afternoon on the bank. Can't get much better, except I know the barbel go to double figures here... but that's for another day. So the carp gear has been packed away, and plans were being made for our first pike trip of the season... that was until I checked my emails. There amongst all the spam was a message titled 'Barbel'. It turned out to be from a friend who also happens to be a river Lea bailiff, and besides asking how I was doing, he wanted to let me know that one of his stretches was fishing very well, so wasn't it about time Gary and myself came over and had a go. Well, with the weather still staying reasonably mild, and the occasional downpour of rain putting some water in the rivers, it seemed like a good idea. So the pike gear's left where it is and the barbel rod's are slipped into the quiver! I met Gary at a local shopping centre, and after he'd got his 'sarnies', we trundled off towards the venue. With the SatNav's help we found our way to the small car park that lay not far from the river. With the weather preceding our trip out becoming rather chilly Gary felt a bit of chubbing might be the order of the day, as the sudden drop in temperature would probably keep the barbel off the feed, and I didn't disagree, anyway this was an exploratory outing so any fish would be a bonus. On arrival it was on with the cold weather gear and off across the field to the far end of the fishery, spending a little time in each swim, looking for features, or any areas that might reasonably hold fish... and some lovely spots there were too. 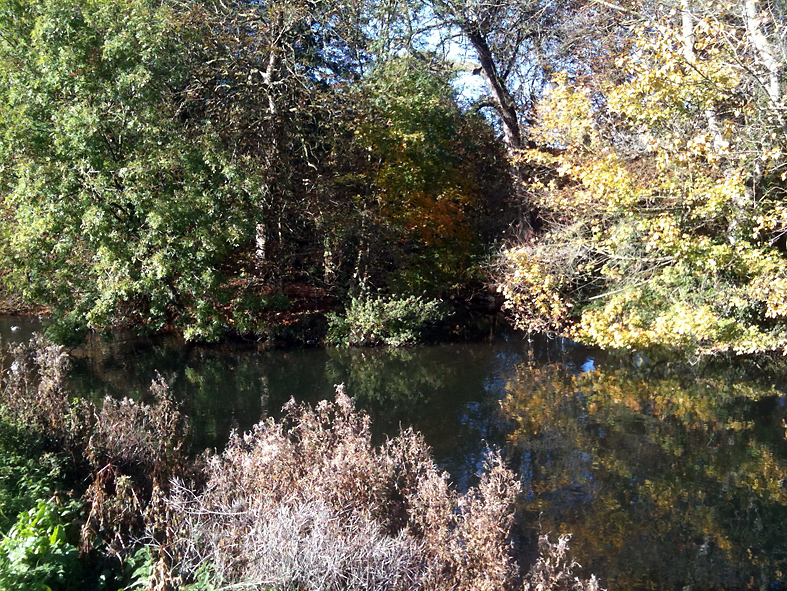 All the colours of Autumn, let's hope the fish are here? So being the industrious chaps we are, it's only 10mins later and we're sitting in a local cafe tucking into our plates of 'full english'... now that's my sort of fishing! As breakfast is settling in our stomachs, we're back at the car park and setting up the rods. We both made the decision to travel light on this trip, as finding out about the venue was more the priority than really targeting the big fish we hope are here. So it's one rod each, a small tackle bag, a light chair, and a landing net, that will keep us mobile. We marched off to the far end of the venue, picked a couple of swims, and started working our way back up, doing half an hour or so in each spot. The first couple of places didn't give me a touch, but then fishing to a little hole in some overhanging bushes on the far bank, I get a good pull round. I bully the fish out of the bushes and play it almost under my own bank, but it's soon out in open water, and I can see the white lips of a decent chub now heading for the landing net. Into the weigh sling and it goes 5lb 8ozs, now that's not a bad start is it! Gary admits he's missed two good bites now as we progress up the river, and I mention the little taps I'm getting, which we put down to the crayfish, so we keep moving. By mid afternoon we've worked our way to near the top of the stretch, and into the area that we'd been told had produced some good fish. I get another strong bite, but it only turns out to be a small chub of about 3lbs... Gary's now getting the hump as he's not managed a fish yet... I snigger. Then there's a shout, and he's into a fish, but as I walk over to help he remarks 'It's only a pike!'... I laugh. This jack got Gary going... he thought it was a big 'un! It's now late afternoon and time to get serious. Yes I know I said this was a fact finding trip, but that didn't stop both of us packing a second rod each! So instead of straight through line, a small lead, and a lobworm on the hook, it's now a short braided hooklink, bigger lead, and a hair rigged pellet... well, Gary goes for a boilie. I'd put out my first rod, slightly downstream, and almost mid-water, and had just cast out the other rod, when out of the corner of my eye I see the tip of my first rod twitch. The second rods dropped into the rest, and as I turn back to the other it arches round sharply. It's now plenty of side strain to keep, what now feels like a decent fish, out of the overhanging branches opposite me. A large boil on the surface of the water shows its moved out into the middle, but then it dives and sits doggedly on the bottom. The pressure finally tells and after a couple more lunges I carefully steer the fish into the waiting net which Gary is now holding. 'That's a big lump mate' he says, as I help him up the steep bank. 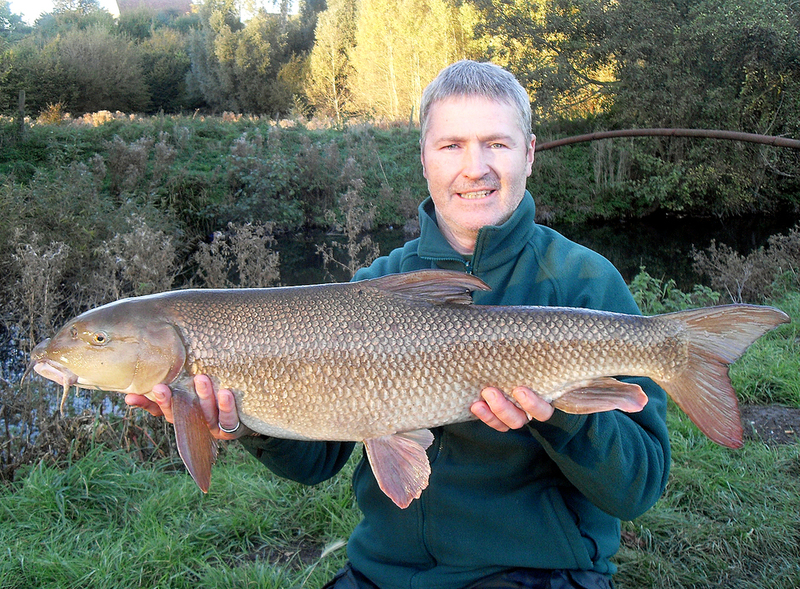 On the mat, out with the hook, and the moment of truth... 14lb 8 and a half ounces, now that's a cracking Lea barbel! We give it till an hour into dark but there's no more excitement. So what a first session this has turned out to be, and as we walk back to the cars I think we're both very happy with the potential of what could be in here... but only one of us is grinning like an idiot!